The wood in the posts of the fort sections on the swing sets can weaken due to rotting, posing a fall hazard. 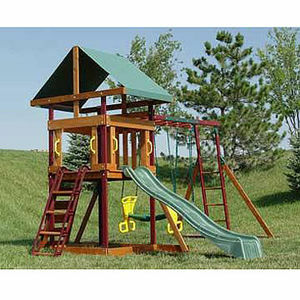 Adventure Playsets has received more than 500 complaints reporting concern over the weakened wood in the 2x4 plastic-coated uprights. One report of a fall was received when the ladder failed resulting in bruises and scratches. Academy Sports (the Yukon); Mills and Menards (the Ventura/II) all from 2005 to 2007; Mills (the Belmont) in 2004; Toys-R-Us (the Bellevue/II); and Walmart (the Tacoma/II, Durango/II, and Sedona). The units sold for $300-$600.